Plain and simple, you are a truly giving person, and a great boon to the Saltwater community. I picked up my second half yesterday, and just hearing about Richardâ€™s generosity from others doesnâ€™t prepare you for what he does. It was like Christmas all over again hunting through all the wonderful surprises. The rock was even better than the first half, with corals and clams and what not attached. The other box with the critters was just packed. Landscaping was fun figuring out, and may change. I had so many bags my tank and sump were almost over flowing. Lid back on and lights! It looks like a rock the size of a small marble, with a dime sized cluster of what looks like fiber optics that glow a pale green in color. I may try to get a clearer picture later and repost. 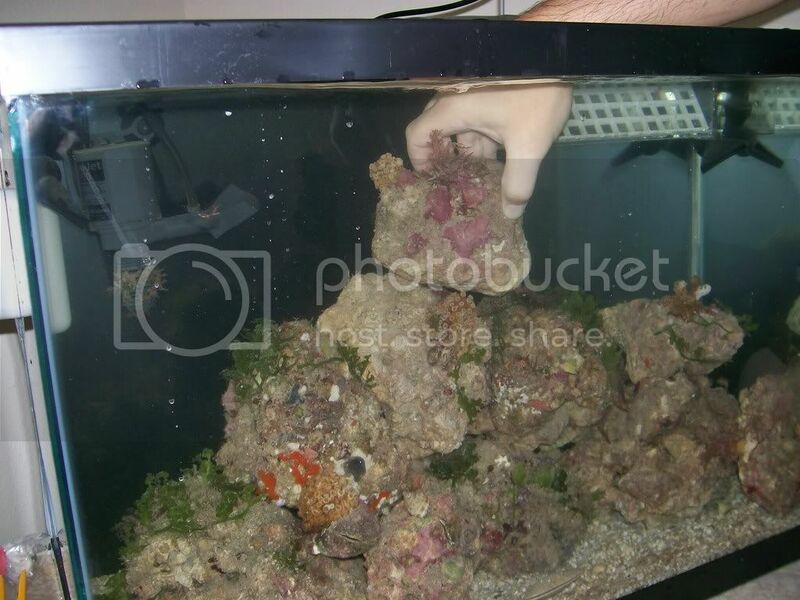 I placed the small rock with it on a protective ledge of another rock so it wouldnâ€™t shift in the current much. I took readings yesterday before adding anything, and again today and I can see the spike already flowing through the Nitrogen cycle. The ammonia is staying low so far, and being converted very well it seems. I canâ€™t stop watching it, it is so fascinating. The crabs are furiously changing shells. The goby is busy patrolling. The anemone are finding places to attach. Snails are all over the tank. 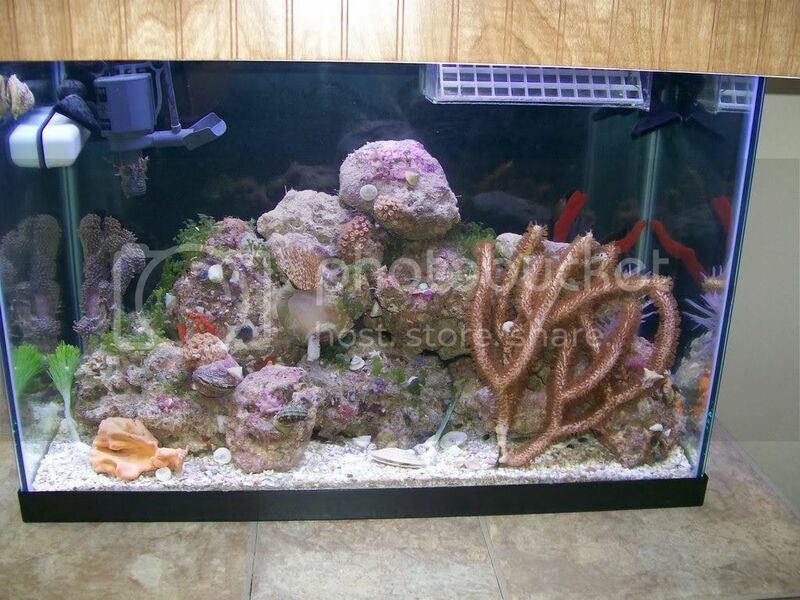 The Gorgonians and sponges are sitting pretty, but Iâ€™m not happy with where they are, will have to work on it. 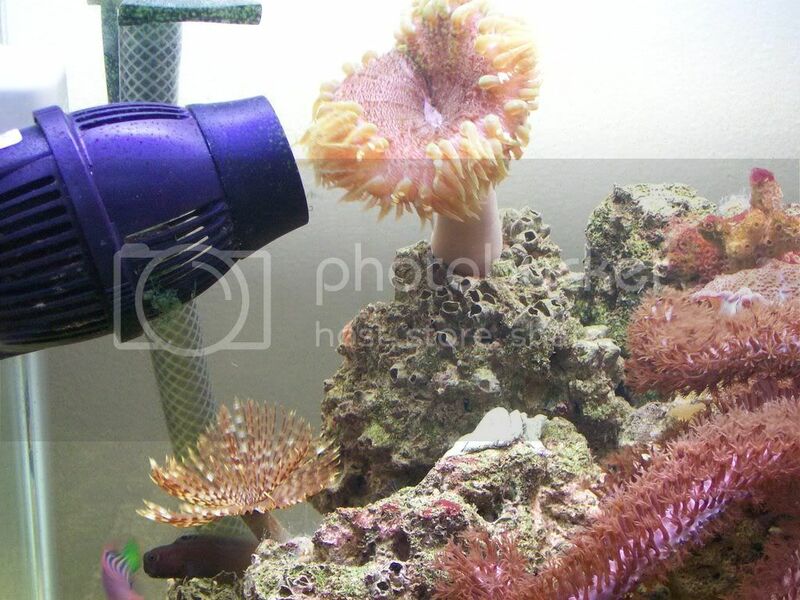 The big fan worm is busy filtering when the decorator crab isnâ€™t bothering it. There is just so much to watch. Again, Thank you very much Richard. Outstanding! I am absolutely amazed at the rock/livestock & thrilled for you David My neck hurts from staring at the screen so I hope you parked your tank next to a comfy chair lol!!! What a great package! You did a great job on your tank! I am impressed! little green alien guy is a ricordia ....from the Keys! oh yea...and the plants need to be 'rooted' in the sand, like a small potted plant...they will root in a few weeks.....and eat nitrates while they are at it! I don't know whether to be excited, or to start shaking in horror. Seems that Soda water didn't clear out all the hitchhikers. They can be kinda hard. Just do a search and try to set up traps to get them. But looks awesome. 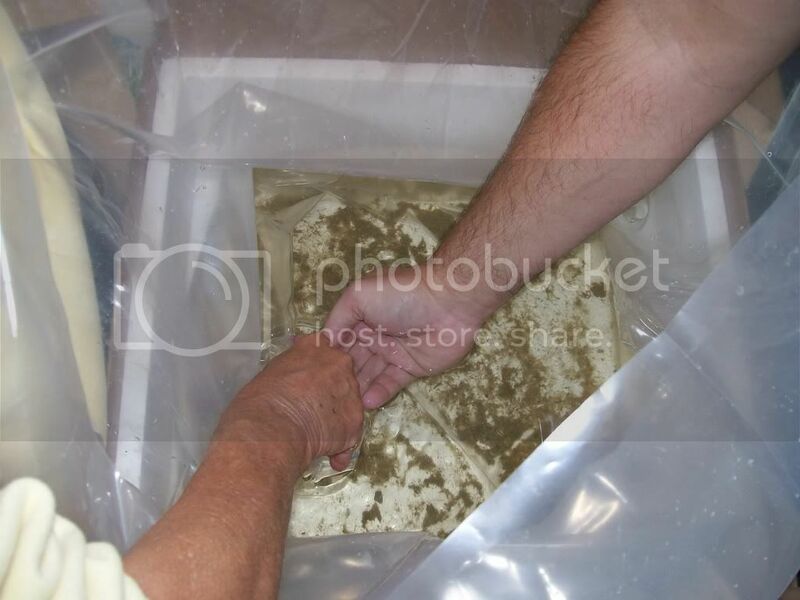 You should always still try to use gloves though in your tank from what I have heard for your protection from the critters and other biological organisms that may be contained inside your aquarium. Nice shot's I like the purple anenome, did he come in the first shipment? Did he gro to that size from a little guy, or was he that big out the bag? He is brand new out of the bag. I specifically ask for the Condylacitis anemone when I let Richard know I was ready for the second half last week end. I am hoping that when I add my tomato clown he takes to it. It is somewhere between baseball and softball size. The hunt begins, but I am thwarted at every turn. Finally I decide if he wonâ€™t come to me, I would have to go get him and dismantled all my rock while he watched with a mocking look. Once I got his rock out, I spent 30 minutes squirting his hole, but he wasnâ€™t budging. I finally took a piece of hard air line tubing and gently prodded him until he was out. Then I had to rebuild the rocks without squashing anyone. That was fun. 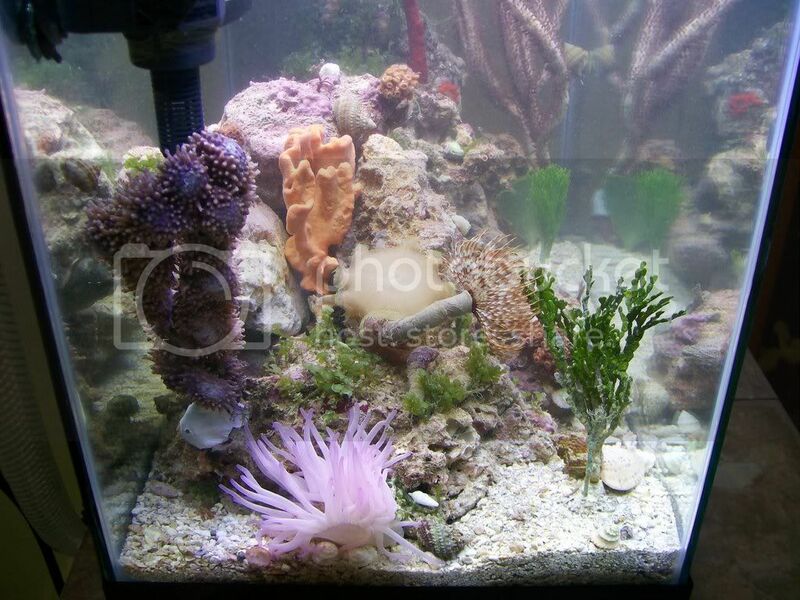 The tank ended up looking very different, and my anemones seems to claim the big open area on the left of the tank. I was finally able to secure my gorgonians and my plants are now firmly planted. At the front entrance of the Hyatt, I have dedicated doormen. My goby is constantly on the prowl. 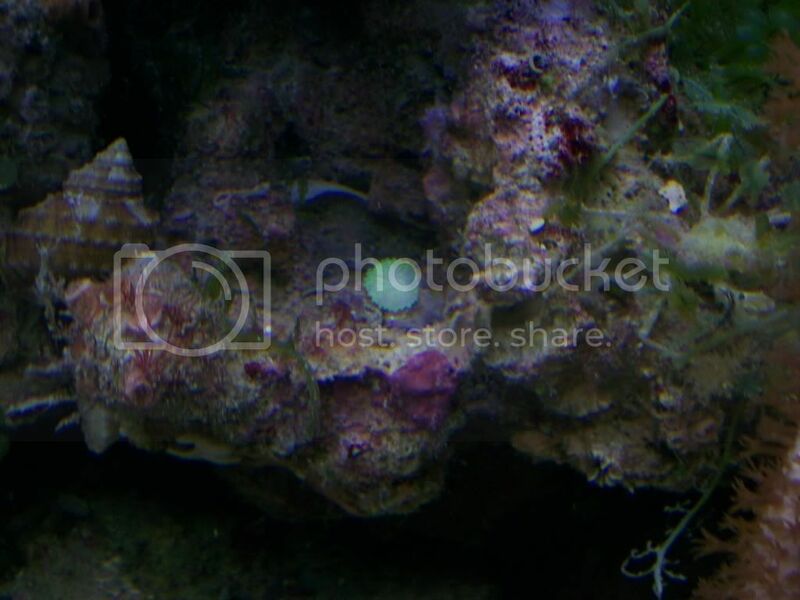 My clam and his attached coral are just chilling. The bad news? I still hear popping in my tank. Pray it is a pistol shrimp. Look's good was the anenome extra? I will check outthe page..
that looks awesome, but I should ask, did you buy just the package and get a bunch of thrown in extras? or did you order some of those other things as well (sponges, anemones, etc)? 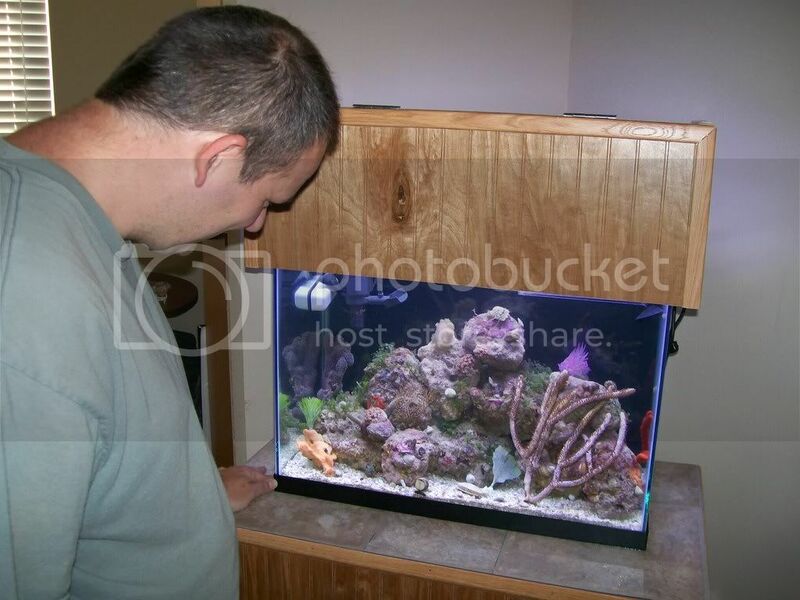 that is an awesome looking tank, you did a great job on the layout. how are all of your sponges doing? 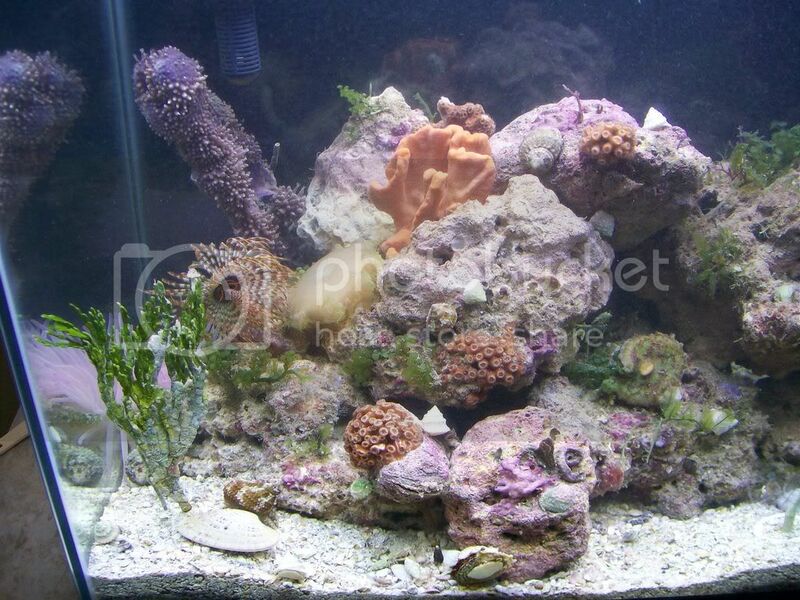 what is that in the back on the far left side, is that a hugeeee gongorian or what..richard's generosity is always a pleasant and unexpected surprise..usually it takes years of collecting different corals and plants at an HUGE expense to have a tank that looks that good. that is the amazing thing about the tbs you get an instant reef.. great thread dklaue & awesome pics! what kind of camera are you using, i cant get a decent close up with mine. 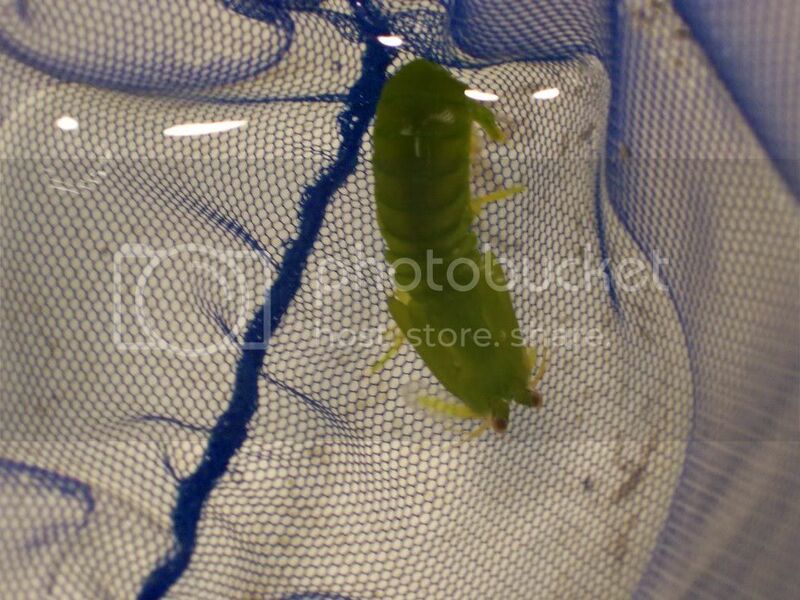 I just discovered a green mantis in my tank but fortunately he is in a quarantine tank so not running amuck in my reef, so far havent had any luck catching him..pretty sad that a 1" shrimp can outwit me..lol. Keep us posted! these threads make me want to start a TBS tank. Good luck with a clown hosting the Condi as I have never heard of a clown hosting one, but they are colorfull and nice to look at. great tank. now i wanna set up one, too. Very nice! I like how the aquascaping came out the second time... looks like a good shady spot (cave) in the center. Sorry for the long absence, it has been a busy year, but my tank is still going strong. Here are some answers to comments and an update on how my tank is doing. No, everything in the pictures above were generously provided by Richard. 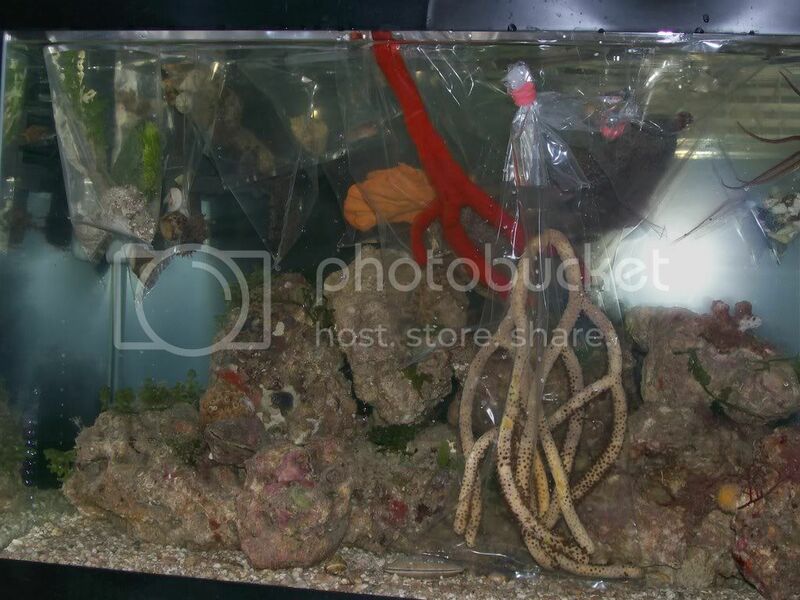 I bought a 25g package and that is everything you see in my tank, it was all provided by Richard and included in the original package price, he threw in lots of extras including the anemones and sponges. In the upper pictures there is nothing that was not included in the package. 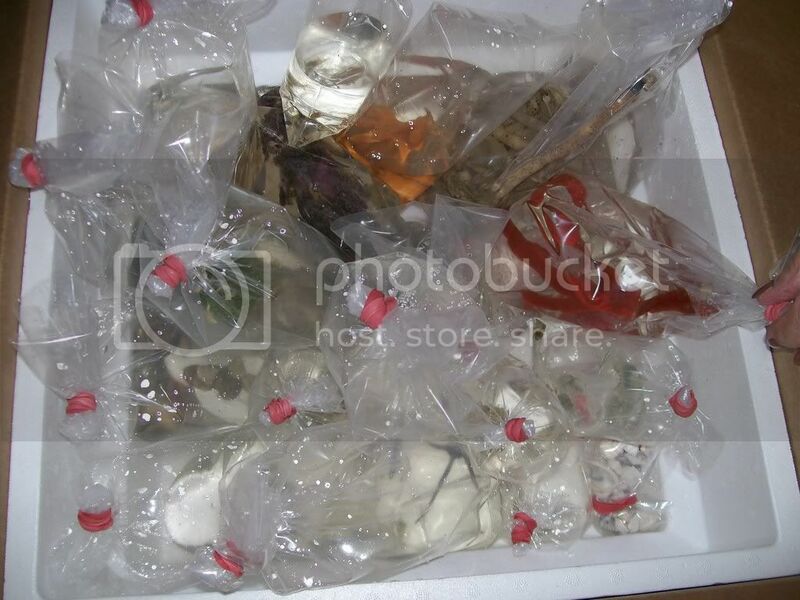 In the below pictures it is still all the same package except the addition of a few fish. I still have about 2/3 of my sponges. I lost my red tree sponge about 6 months ago. It got caught in a red algae growth that i didn't notice which clogged it up I guess. It withered and started to disintegrate soon after no matter what I tried. Other sponges on rocks that were exposed to direct light seems to slowly shrink without dieing, then disappeared. The other sponges that were not in direct light (mostly at the base of rocks near the sand line or on the bottom of rocks) still seem to thrive and some have actually grown double their original size. I even have one that keeps expanding and tends to cement rocks together if they sit next to each other where it is. The camera i use is a Kodak Easyshare C743. Nothing fancy or expensive. I put it on a tripod to prevent shaking, and I use the close up option for pictures 24" or closer. these threads make me want to start a TBS tank. Good luck with a clown hosting the Condi as I have never heard of a clown hosting one, but they are colorful and nice to look at. A good friend will come and bail you out of jail... but a true friend will be sitting next to you saying, "Damn... that was fun!!!" 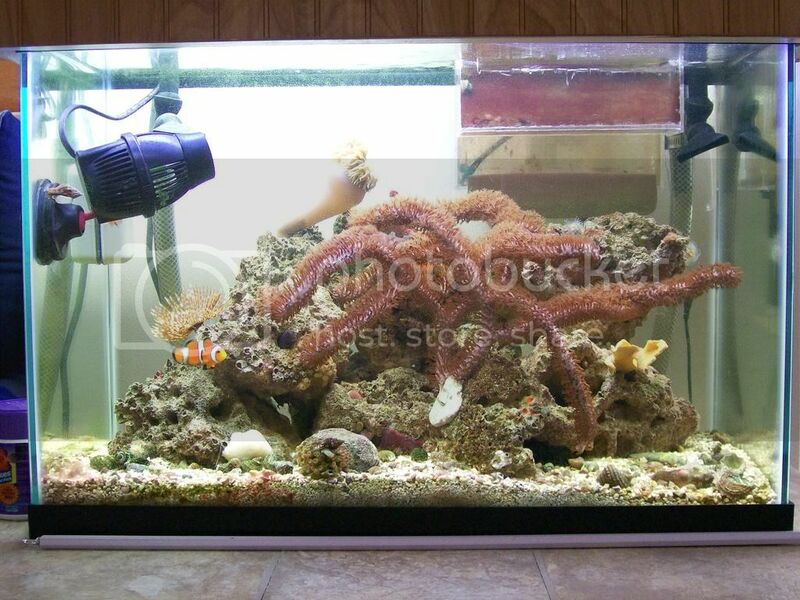 As I mentioned while answering the questions, my tank is still 100% "The Package" with the exception of the fish which include 2 Ocellaris Clownfish, a Bi-color Blenny, and a Six line wrasse. I have also added a few extra Nassarius Snail due to attrition. I do 30% water changes about once every 2 months. 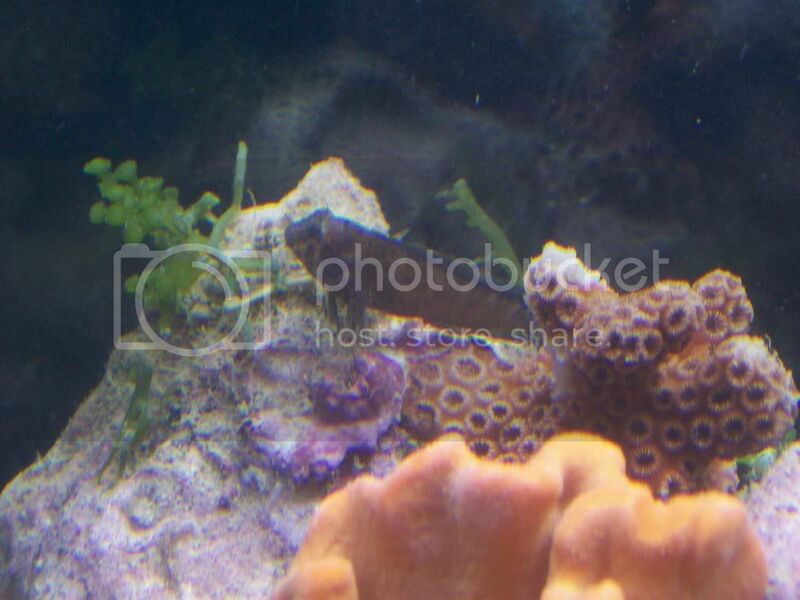 * The Goby that Richard included as an extra decided to go carpet surfing. * The Condi decided to play with my powerhead, but the powerhead didn't want to be friendly. 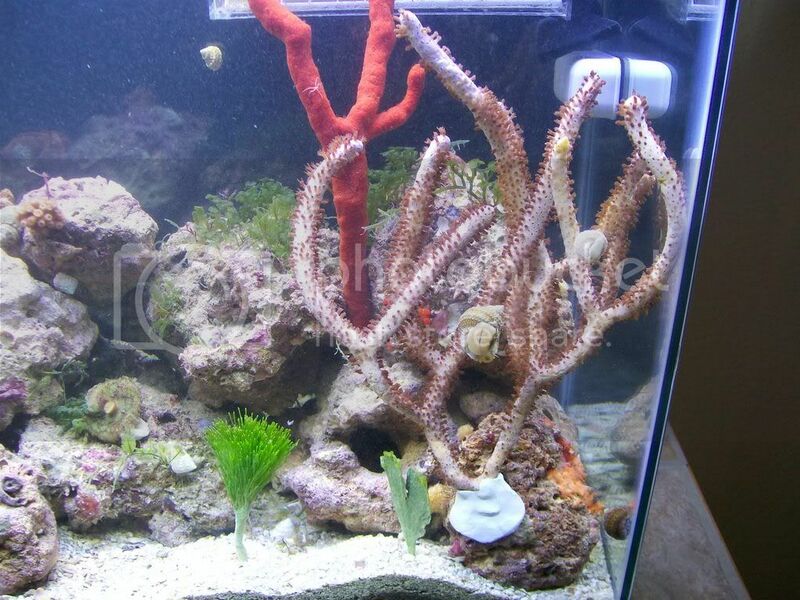 * The red tree sponge lost to a red algae bloom, and other sponges lost due to direct exposure to lights. * The small purple gorgonian developed white moldy looking spots soon after I got it, and after reading a post about it from another package owner I tried to trim the spots off with scissors but it never fully recovered. * The various Caulerpa Algae just wouldn't stop growing and every couple weeks would take over the tank. 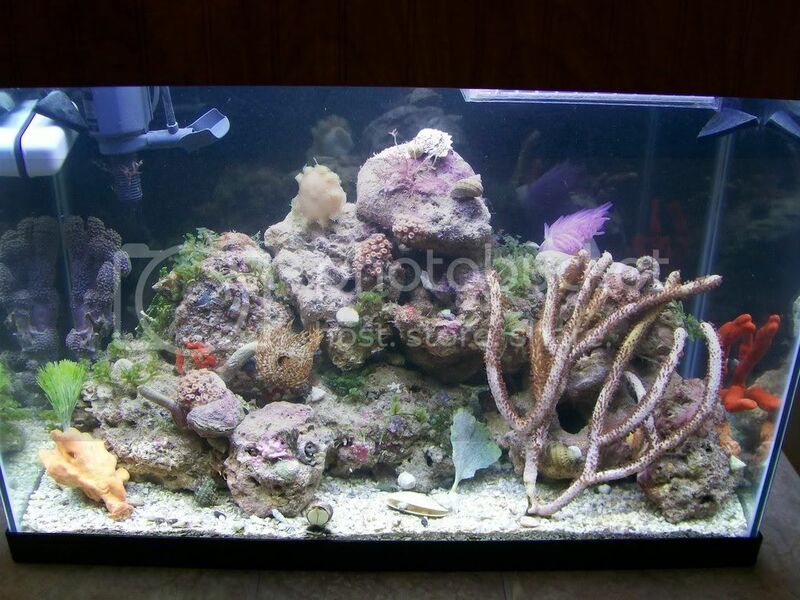 One day I decided to remove it for a more ascetic look since it would hide everything in the tank and always was difficult to remove without causing rocks to fall. I now sort of regret doing it and wish I would have just been more diligent in trimming it. * The brown gorgonian is huge and growing still. I plan to trim it and place half of it in a new tank I am planning. 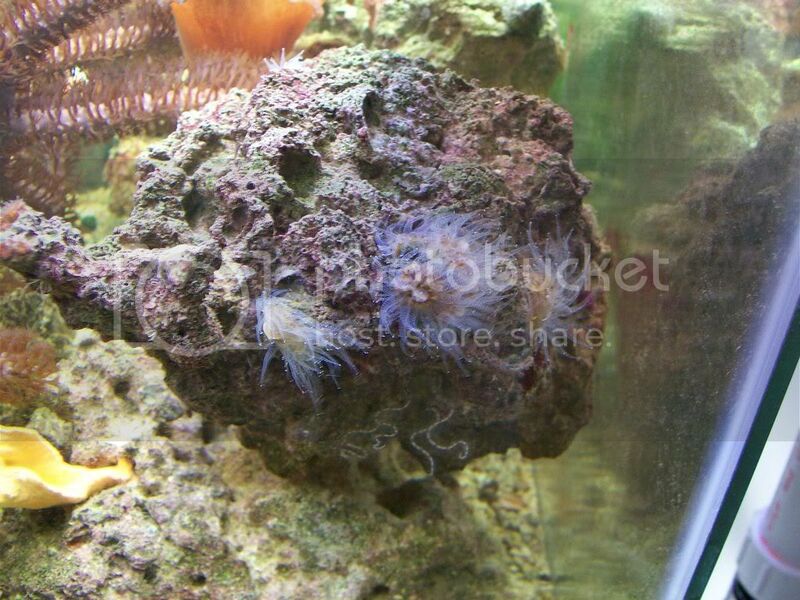 * The green flower anemone is thriving and has grown about 2 inches in girth and is a nice health shade of green. * The green ricordia has flourished and when it stretches fully open is about 5-6â€� across. 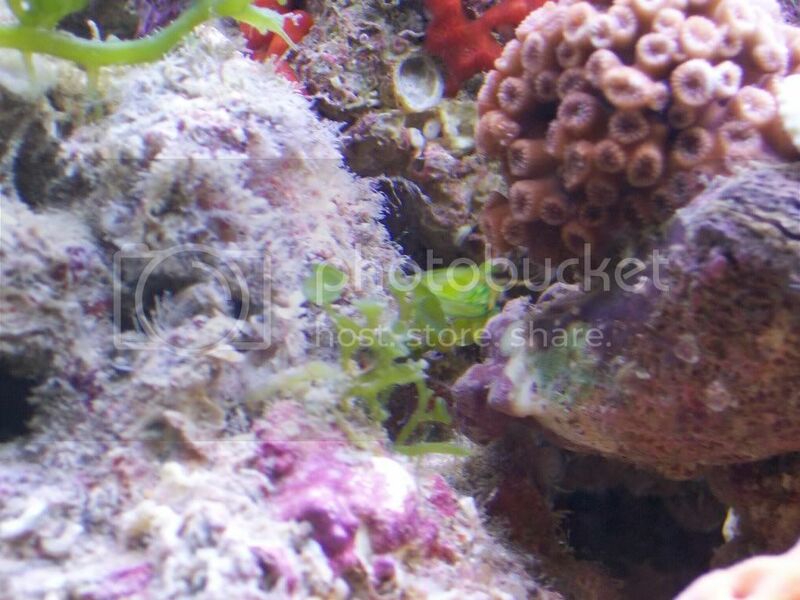 * Many cup corals that looks like just left over skeletons on the rocks started to grow and I have about a dozen on various rocks, many the are the size of golf balls when the spread their tentacles. 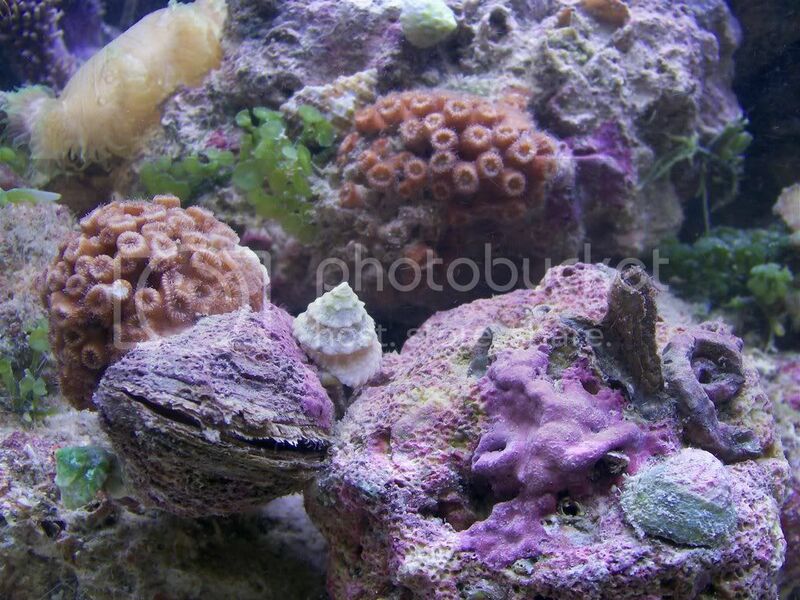 * Many tube corals are on various rocks, some small some in big colonies. These have gone through cycles where they looked like skeletons one month, and the next month turn a nice reddish brown shade with great polyp extension. They are just starting to recover from their latest cycle, and I wish I could make them more stable, but I have not lost any so far. * The large Feather duster has done very well. 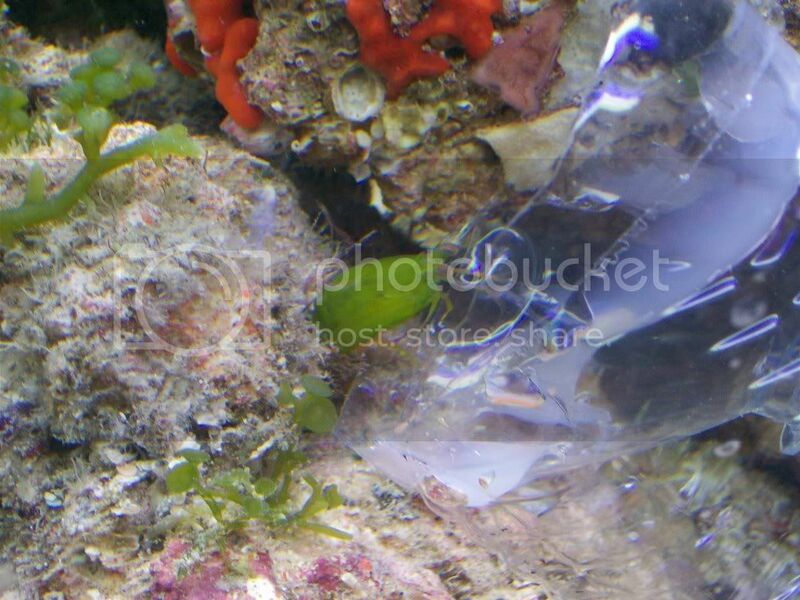 It even had a baby at one point, unfortunately during one of the Caulerpa â€œmowingsâ€� a rock shifted and the baby was crushed. 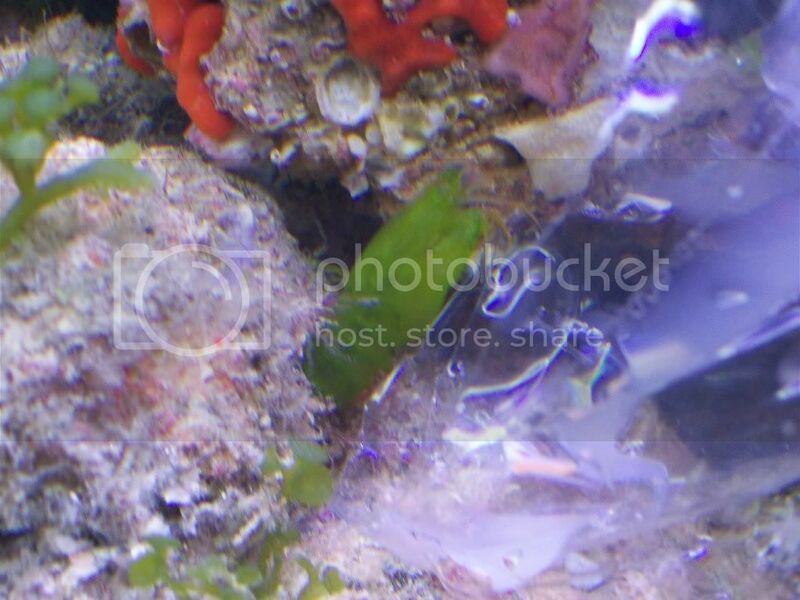 * The clam/mussel with the colony of tube corals is still alive and well except he came unglued from his base rock about 2 weeks ago. 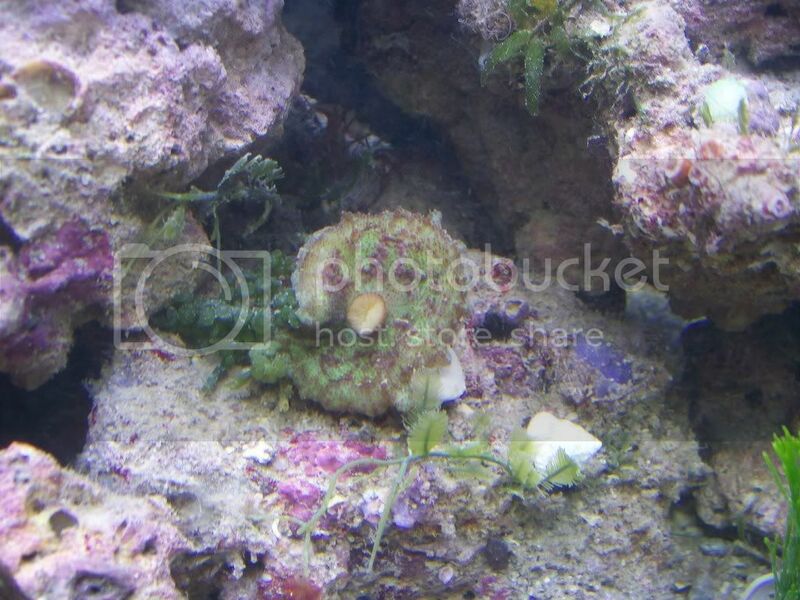 * The Orange fan sponge is still alive but has not grown, and I still have a yellow ball sponge on the back of another rock with a few other sponges on the bases of some of the rocks. 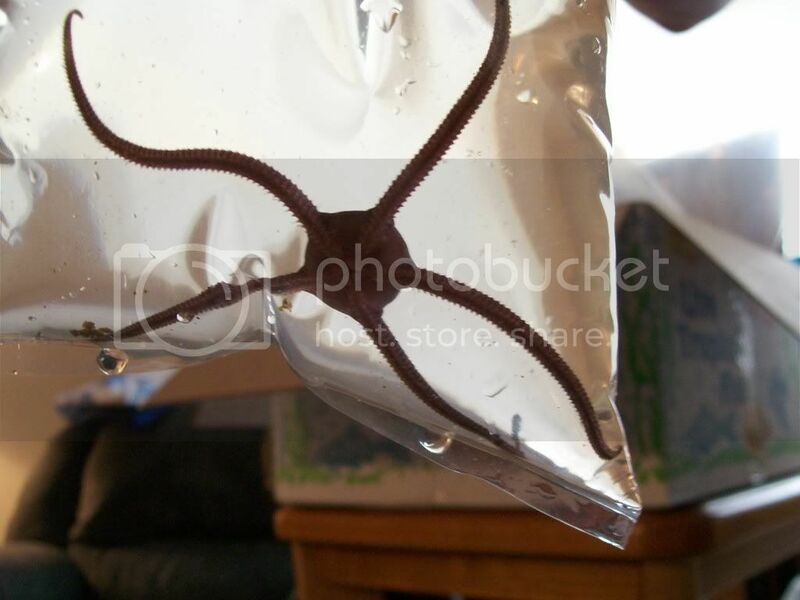 I plan to start feeding plankton to my tank soon hoping to give it more food. * I still have a thriving population of Blueleg hermits. * There are still about half a dozen porcelain crabs always filtering with their fans. 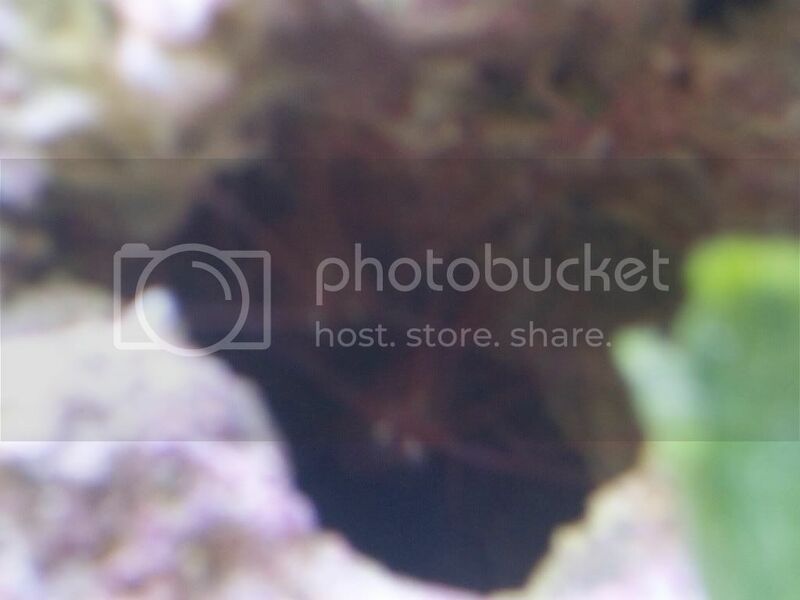 * My Mantis shrimp is still alive and well in his own 10g tank. 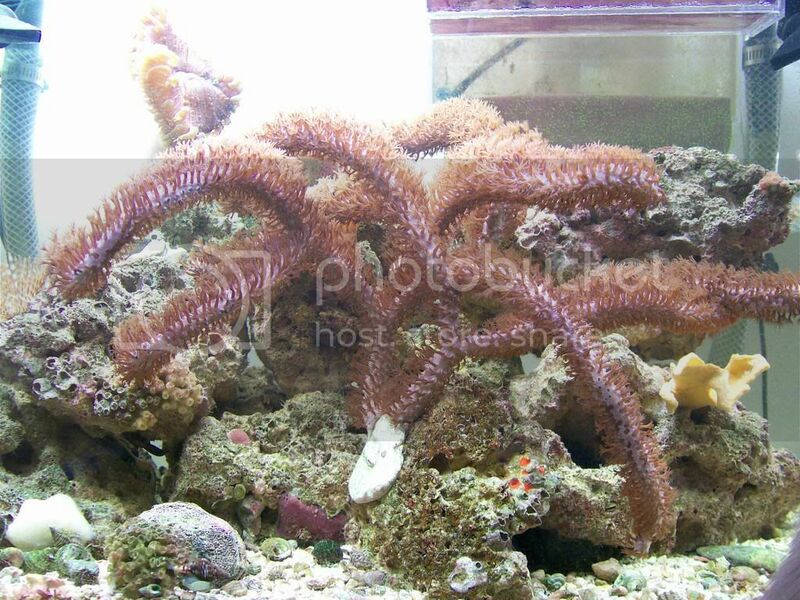 * There are tons of starfish in the sand and under/in the rocks including the large one from the package. 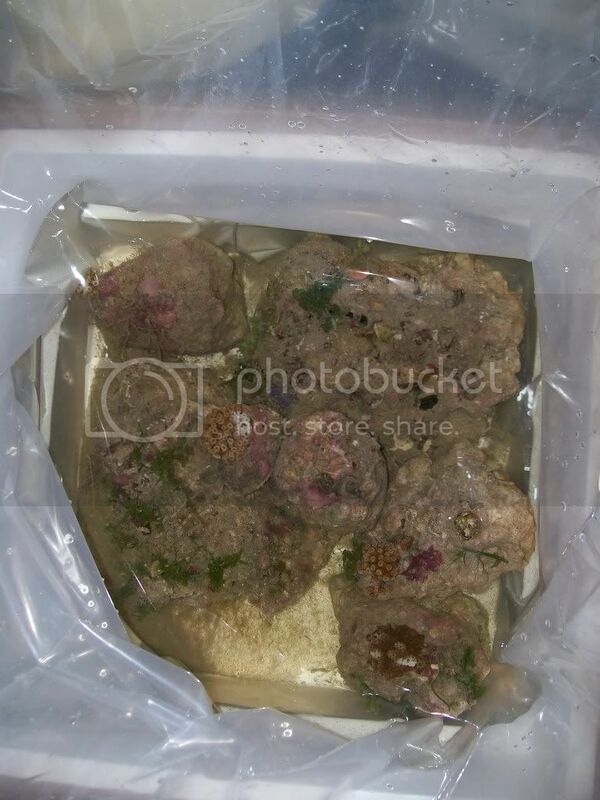 * Unfortunately I still have about 3-4 small gorilla crabs hiding in the rocks and I think they are the main cause of snail losses. * Also there is one unknown. I have a loud popping in my tank from time to time since the start of this. 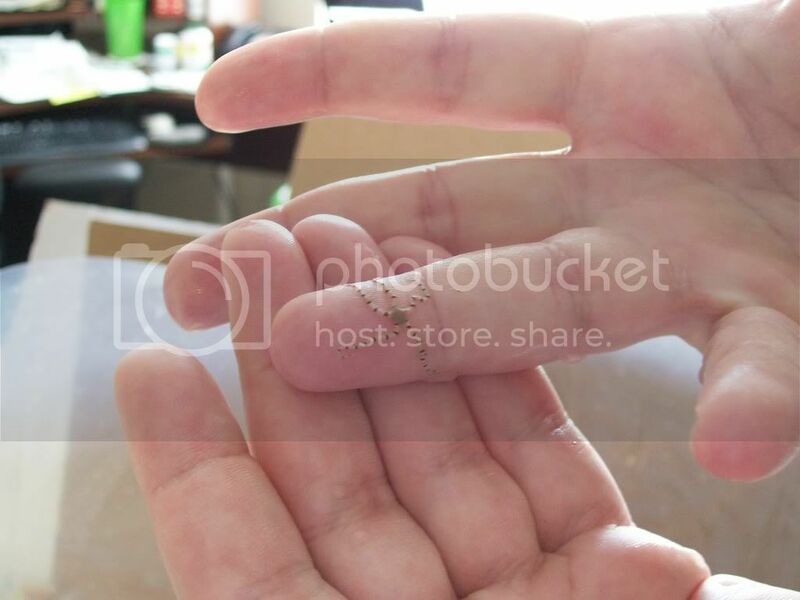 I don't think it is another Mantis because I don't think one could hide for over a year. Might be a pistol shrimp, but again I have never seen one, so I am clueless what is causing my mysterious popping. This is my huge gorgonian. 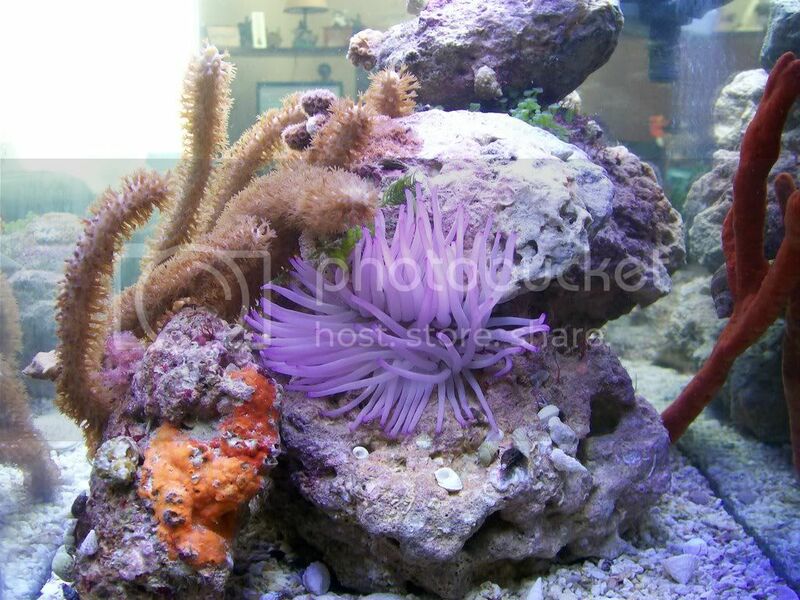 In the upper left you can see my rock/flower anemone. Along the lower edges of rocks you can see various sponges with the orange one to the right. Also in the front left is a mussel with a tube coral colony attached. 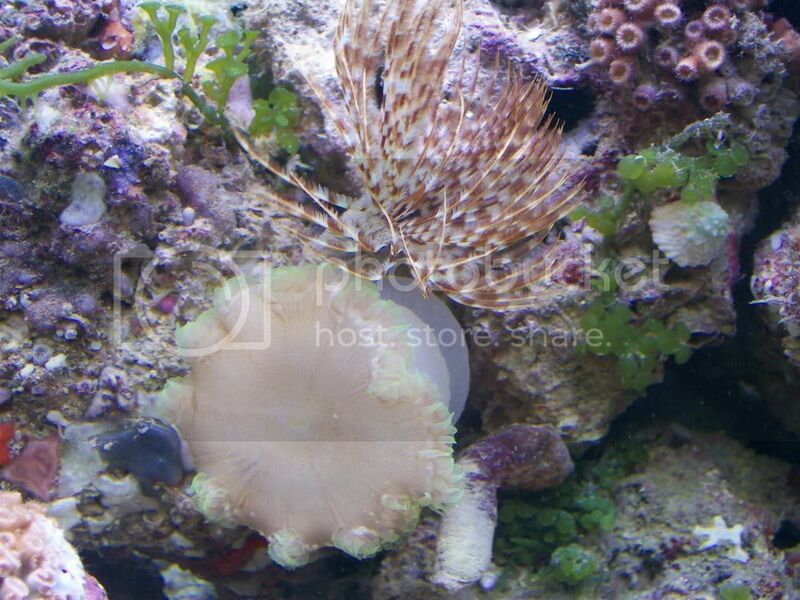 Here you can see the Flower Anemone top center, and the large Feather duster lower left. 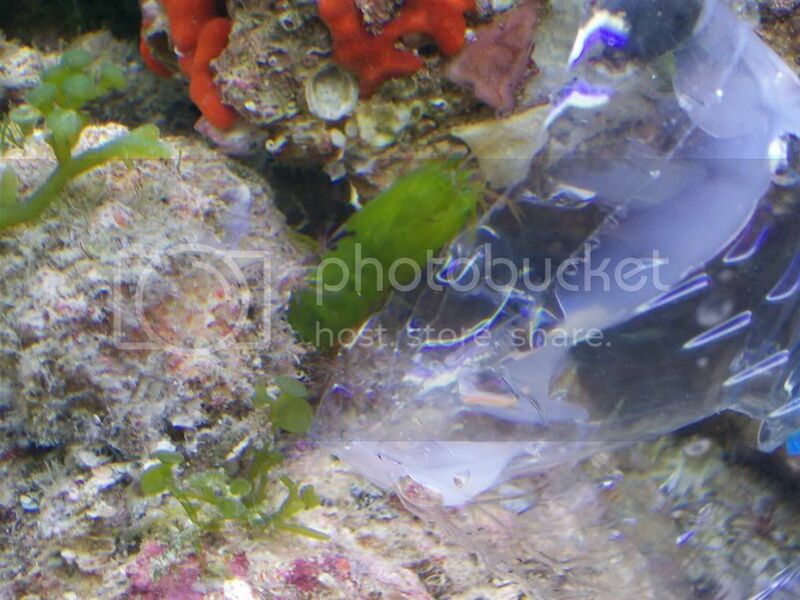 Below the feather duster is my bi-color blenny, and six line wrasse. In the center you can see my green ricordia which is now about 5-6 inches across when it fully spreads out. 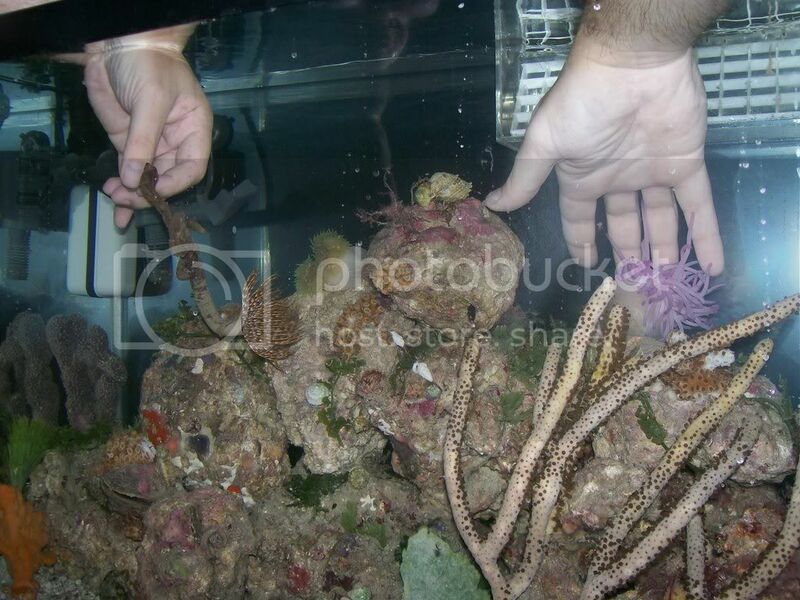 In the front you see part of my gorgonian and in the back is a tube coral colony. These cup corals are about 1.5 inches across each. Below them you can see some starfish arms hanging from the rock. 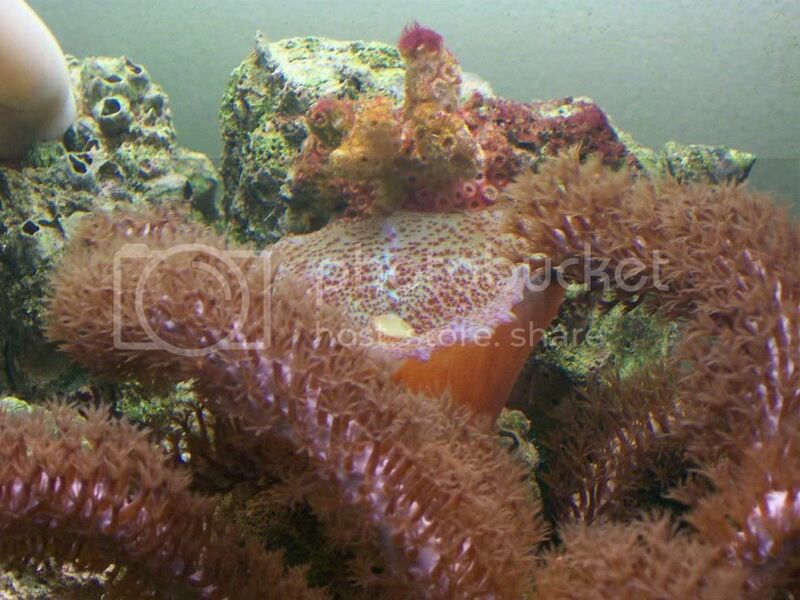 The left tip of rock has some tube corals, and part of the orange sponge is seen to the lower left. In the upper left background is part of the gorgonian and the ricordia. Last edited by dklaue; 05/23/2008 at 09:15 AM. 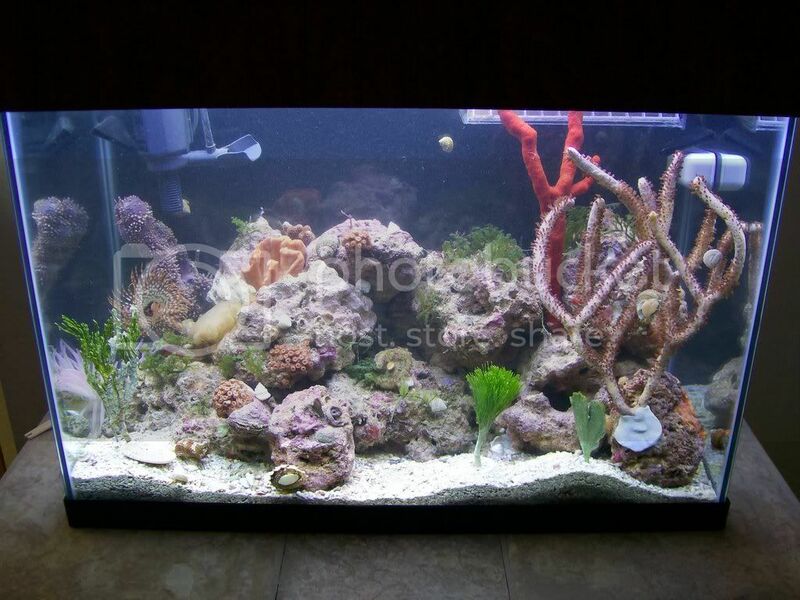 I am currently trying to plan a new 90g tank and am torn on how to start it. The Package is so tempting to try again, but I would also like to try it from scratch and cherry pick rocks and creatures. I have been thinking of maybe doing a half and half. Getting a 45g package to start it which would leave lots of room to add more rock and such later, but one problem is the sand. I have the normal sand in 20# packages, but it is dead of course, but that would not work well because the Package needs its true Live sand to work right without harming the rocks and critters. Has anyone every tried a mixed approach? 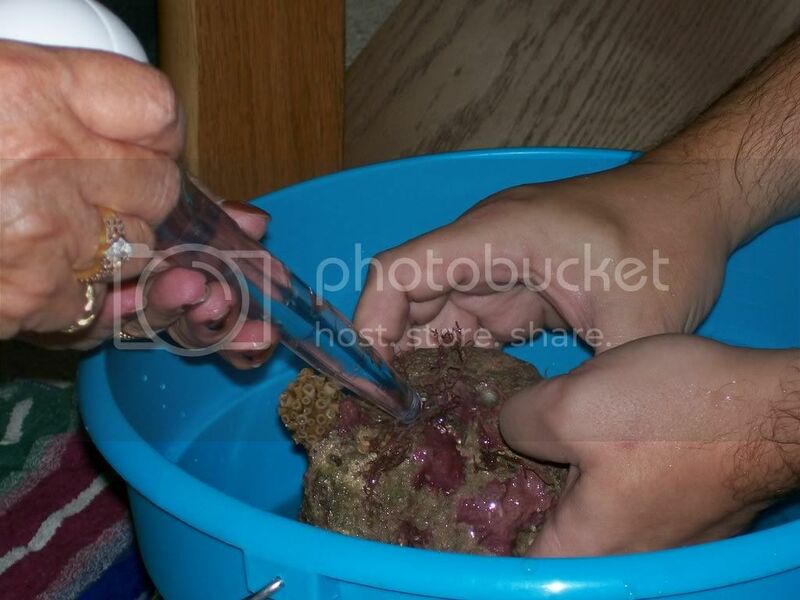 Start with Richards live sand, then add more normal sand later? Would it work, and would it even look appealing? Maybe if there was a way to put the Live sand on one side and the plain sand on the other with a slight mixed area where they meet in the center?